When our guide said to lay down the paddle and just grab and pull, I realized this wasn’t going to be the usual kind of kayaking adventure. 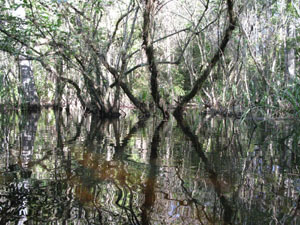 Paddling through the mangroves of Big Cypress National Reserve meant using branches, roots, and vines along the Turner River just north of Everglades National Park to maneuver our way down the river. Earlier we had disconnected our two-sided paddles and used only half to forge our way through the river’s narrow channels. Although I’ve kayaked in many rivers and lakes, this was a new way of managing turns and tucks around a variety of natural obstacles. Not only were we constantly watching for alligators and feeding birds so we could paddle far enough away not to disturb them, but we also had to dodge low-hanging branches, sharp sawgrass along the water’s edge, and dense hydrilla patches in the river. Our group of four—my husband Larry and me and a young couple from Germany—had listened to a brief introduction by our guide from Everglades Adventures. She explained that for this excursion we would drive to the put-in off Florida’s Hwy. 41, paddle upriver on the Turner River Paddling Trail, swish through the river of grass, return to the put-in for a bathroom break, and then paddle south to the mangroves. Big Cypress National Reserve was created in 1974 to protect water quality, natural resources, and ecological integrity of Big Cypress Swamp. 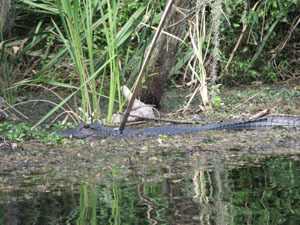 It is home to the American alligator, Florida’s largest reptile. Anhingas, egrets, and herons are plentiful. Lucky visitors may see river otter, bobcats, black bear, and the endangered Florida panther. A variety of plants, including tiny purple orchids and spiky bromeliads were in rare bloom during our October adventure. 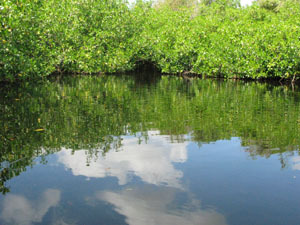 For almost two hours we paddled upriver, enjoying the beautiful sunshine, cloudless blue sky, and lush foliage. Our paddles swooshed in the water as we listened to birds cawing, fish splashing, and bugs buzzing. Tiny alligators slithered among breaking branches and rustling leaves. Occasional sighs and whispers from kayakers interrupted the dainty chorus of nature sounds. After our break, we glided under a low bridge, slithering our bodies way down into our boats for passage. Shortly after that our guide suggested we separate paddles to better maneuver through tight spaces. Lunch time came with nary a parking spot in sight, so we backed our kayaks into a tiny cove and devoured our packaged sandwiches. 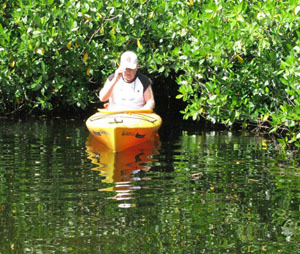 Back on the trail, we entered the mangrove tunnel where paddling was impossible. Abandoning our paddles at this point, we used our hands to grab and go. That technique worked fine as long as stumps, roots, and vines were within easy reach, which wasn’t always the case. Thoughts of stopping to take pictures vanished as the current didn’t allow movement to pause. The moment I let the kayak drift I ended up stuck in a clump of sawgrass and had even more work to get myself free and pointed in the right direction. 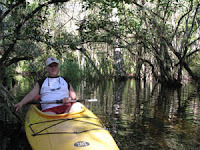 At one point the guide hitched my kayak to hers, and the two of us cleared a path for the others through thick hydrilla. After struggling through the mangroves, the river suddenly opened into a spectacular pool, the perfect sport for reflecting on our journey. Big Cypress National Reserve manages a broad range of recreational activities including kayaking/canoeing, hiking, and hunting. The entire Turner River Paddling Trail covers almost 10 miles and takes four to seven hours depending on river conditions and ability of the kayakers.